Hold on...it seems a bit audacious to just throw the word "best" on anything -- sort of like our hesitation about using the word "authentic". I mean, really...it is all so darn subjective. Plus, we ate at both full scale restaurants and hole-in-the-wall taquerias, and also enjoyed food that came from at least nine different countries. Therefore, to start out our lists of the "best", we decided to search not our notes and analysis for best dish, but our memory banks for most memorable experience. After all, when smell and taste are involved, the memories can be quiet telling. Therefore, be ready for a totally unscientific list. But just try and disagree. I guarantee that what we share here will make you hungry, so read on and prepare to go get lunch. 1. Maya Cuisine: Its hard not to remember a place that featured so many different options for tacos, tamales and salsas. Add homemade tortillas to that list and how can it not make a best of list. Most memorable foods: chipotle chicken; barbacoa; spinach, mushroom, and cheese tamal. 2. Mañana Pupuseria: They combine a solid mix of pupuseria and Mexican eatery with a foundation of years and years of cooking and experience. The folks are kind and the food is real. Plus, it was one of the only places that mentioned local farms and farmers markets. Most memorable foods: pasteles con carne; pastor tacos; pupusas. 3. Bymore Taqueria: These folks aren't messing around, especially with their meat. They carry a professional, yet welcoming attitude in their little taqueria and the food shows as it is consistently excellent. Most memorable foods: hand pressed sopes; corn quesadillas; alambres; salsa verde. 4. Taqueria Hidalgo: Small, unassuming, and somewhat hard to find, this place really surprised us. It was one of the few places where everything was outstanding. Most memorable foods: beef soup; black beans; tortas; pastor; picaditas. 5. Homi: One of the few extremely original eateries we visited. Everything at Homi seems to have their own version or "take" and the quality was bar none. Most memorable foods: mole and pipian roja sauces; tamales; pastor tacos. 6. 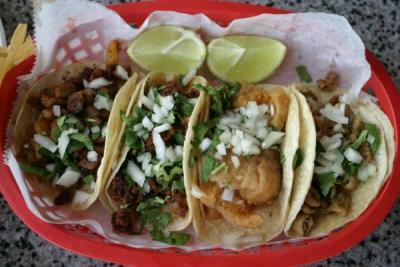 El Taco Riendo: These guys get our top rating in large part due to their service. They went out of their way to share their love of food with us. Plus, the large variety of meats and their mole sauce helped out quiet a bit. Most memorable foods: mole enchiladas; barbacoa; chilaquiles. 7. Catalina's: No one could really compare with Catalina's in terms of uniqueness and freshness. It was definitely one of the only places with an open kitchen, freshly roasted poblano peppers, and made to order flour tortillas. Most memorable foods: mixiotes; chile rellenos; extra tasty beans; fresh tortillas. 8. Taqueria Morales/La Poblanita: Nothing can really describe La Poblanita, except that it is very real. You just have to go and see what happens. I simply remember wanting to order everything again when we left and still being unsure of where we were. Most memorable foods: Everything from the salsa verde to the beans were excellent. The handmade masa items were rustic and fabulous, from the tlacoyas to the huaraches. 9. Taqueria El Ranchito: Juan's small and hidden taqueria made this list for a whole host of reasons. The food is just delicious and is all his own. From his fantastic enchilada sauce, to homemade salsas, the recipes are all unique. Add to that a great selection of meats and a guy who works constantly for the food of his country, it is worth a trip to Richfield. 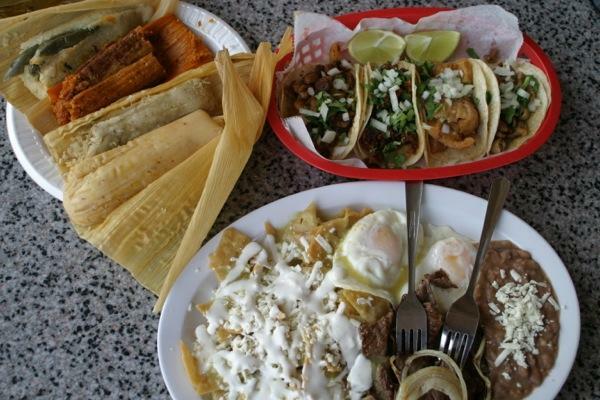 Most memorable foods: tamales, including an amazing and spicy raja; enchiladas; tripe tacos. Plus, Juan made an excellent burrito for my boy. 10. Hilda's (review below): A last minute addition, Hilda's comes out of nowhere. In a trip back to the eastside of St. Paul, we stumbled upon an amazing little place in a Latin marketplace. Check out the bonus review below. 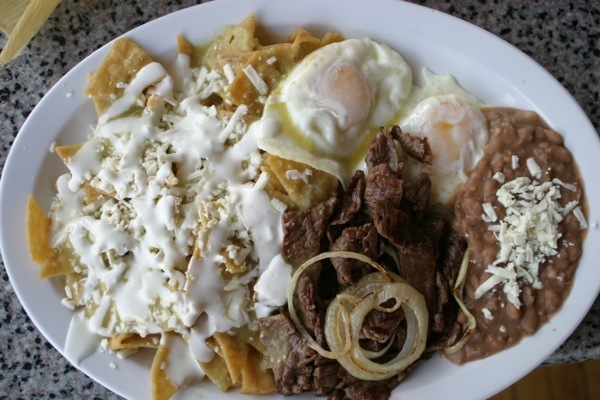 Most memorable foods: best chilaquiles to date; amazing tamales; great chorizo. So, there you have it. After a full year plus of eating Latin foods, we have ten that really stuck with us. But that really can't be the end of it. There are so many highlights of the other Latin eateries we visited that it would be criminal to leave out our favorite tamales, tacos, cochinita pibil, etc. so stay tuned for the sequel where we share with you our favorite menu items. Think of it as your personal taco tour, your chicharron compass, your passport to pambazos. Now, check out the review of Hilda's below, and be sure to tell us if we left out your favorite and why in the comments section. We will be sure to take note. In Brief: Hilda's is a small taqueria inside of the Plaza Latina on Payne avenue, eastside St. Paul. It would be easy to miss, but don't...really. The menu is expansive and they certainly know what they are doing. There is a nice selection of tamales, plenty of options for tacos, chilaquiles, tortas, and many more specialties. The Review: We decided to stop by on our way back to Bymore Taqueria, just a few blocks south on Payne. Once inside, we performed our normal routine that began when we first started reviewing Latin eateries. We ordered a lot of tamales, a basket of different tacos, and then asked our server for her opinion. Her favorite was definitely the chilaquiles. Our eyes lit up as this is consistently one of our favorite meals. She suggested we get it with the cecina, a salted, thin cut flank steak. Ok. The tamales and tacos came out quickly, and I must say I was excited. Sometimes you can just tell when things are going to go well. The oaxaqueño tamal was huge as they often are and unwrapping it left me enveloped in smoke and earth. The adobo sauce was absolutely divine and there was plenty of it. So much in fact, that the masa was lost in the background, but I can accept that when I am in smoky, tomato-y shredded pork bliss. It was a meal in itself. 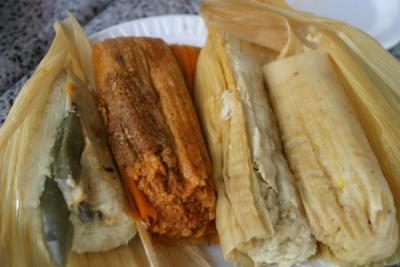 As good as the oaxaqueno tamal was, the others were at least as good, if not better. The standard pork tamal was a nice change from the oaxaqueño in the fact that it was slightly less greasy and the corn flavor stood out in bright and flavorful contrast to the meat. It had a perfect level of spice and held its shape beautifully. The chicken tamal might have been my favorite. It was really moist, with a nice savory/salty balance. It was a great tamal. So was the raja, but then again, I always love a good vegetable/hot pepper tamal. As with the chicken tamal, it had that something extra of savory broth and was made with melty Mexican cheese. As for the tacos, we settled on chicharron, tripas, chorizo, and pastor. The standout here was definitely the chorizo. It was something special. It had such a nice presence of aromatic spice, something akin to coriander, cardamom, and clove. The spices were predominant, even above the normal cumin, onion, and garlic of many chorizos. It was also not super greasy. Go figure, a tasty, not too greasy chorizo that doesn't leave you with terrible breath. It was fantastic. The chicharron was fascinating in that it was new to us in this form. It was larger pieces of fried pork rind that seem to have been stewed. I really liked it, but I'm not sure how those folks who are expecting "cracklins" would react. It sure was interesting. The tripas was the type that is cut in rings, has a modest amount of breading and then is delicately fried. It was really good and reminds me why I like tripas so much. It was very similar to calamari, but with more flavor. Finally, we come to the chilaquiles and let me just say that these are by far the best we've had to date. They came out and looked beautiful, but we were made skeptical by the fact that the chips still maintained their shape and looked...gasp...crispy. Indeed, the chilaquiles from the folks at Hilda's consist of crispy thick tortilla chips cooked with salsa verde until they are just beginning to soften. This leaves the tips of the triangles crispy. It is an amazing textural experience that works to elevate this dish to something more. Of course, the verde was great, the beans tasty and the cecina, absolutely outstanding. It had the expected smoky grill touch, but was also quite tender and well-seasoned, two factors often lacking in our experience. All in all, this might have been the best batch of chilaquiles to date. Nice work! In returning to Hilda's it would be difficult to not order tamales and chilaquiles again. They were simply too good, but when a place has impressed us, it almost begs to be challenged. Let us know if you've been there and what you tried. When we go back, we'll be sure to have a torta and possibly some pozole or menudo. We'll let you know. Prices: Very reasonable: Tamales, $2-3, Tacos $2, Chilaquiles $8. Surprise: It is always a surprise to walk into a place that doesn't really even exist online and suddenly have amazing food. The chilaquiles were definitely a nice surprise. I can't wait to go back. Language: Very easy to order and communicate. No problems. Hours: Hard to tell, I never did find out. The Plaza Latina is open from about 9-9 M-F. I imagine that Hilda's is open about the same hours. Lawrence Black is a writer and editor at Simple, Good and Tasty. He can be reached at lawrence@simplegoodandtasty.com. Beware of his crazy eyes as they search for the next great Latin eatery as well as his almost constant onion breath. Peee-ew. 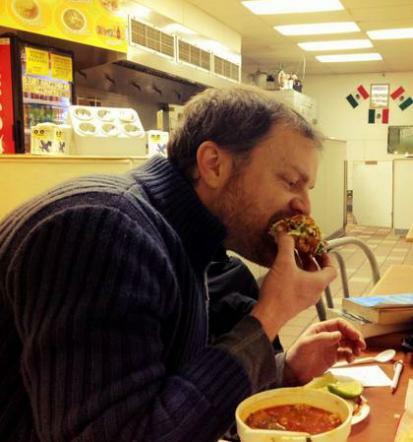 Our last Latin Tongue review was: El Mercado Central.